Sergeant Patrick William KELLY. Born Sydney 1884. Died 11/6/1922 Coast Hospital from ‘Enteric Fever‘ (Typhoid fever) aged 38. Joined 1904, 18 years Service. The attached link is to his obituary is all I can find about this man who died whilst still serving. Some background. The Coast Hospital (established around 1882 to isolate and treat patients with infectious diseases) was particularly valuable during the bubonic plague in Sydney of 1900 and then again when soldiers returning from Europe brought the influenza virus back in 1919. The Coast Hospital became Prince Henry Hospital in 1934. In 2001 services were transferred to Prince of Wales Hospital, Sydney and the hospital site became available for residential use. THE LATE SERGEANT PATRICK WILLIAM KELLY. 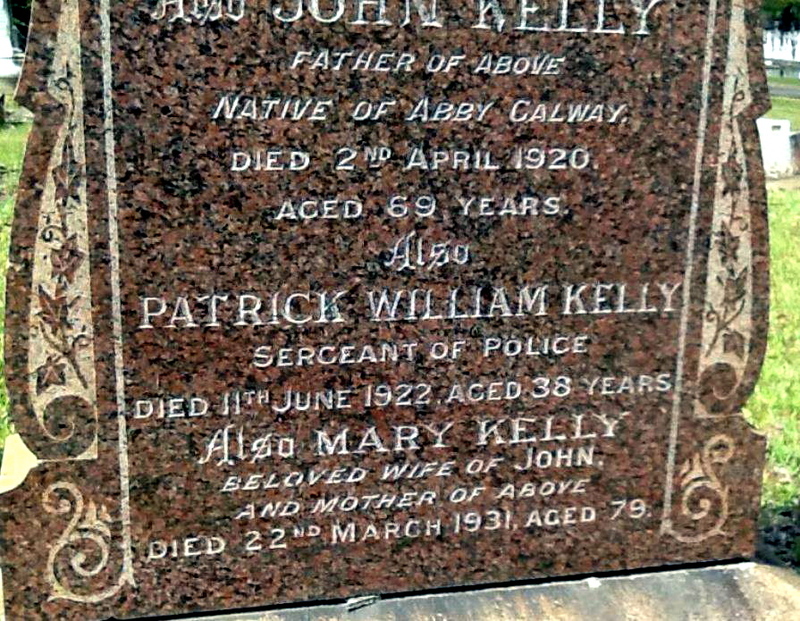 Sergeant Patrick William Kelly, of No. 1 (Clarence-street) Station of the N.S.W. Police, died at the Coast Hospital on the 11th inst. of enteric fever, at the early age of 38 years. 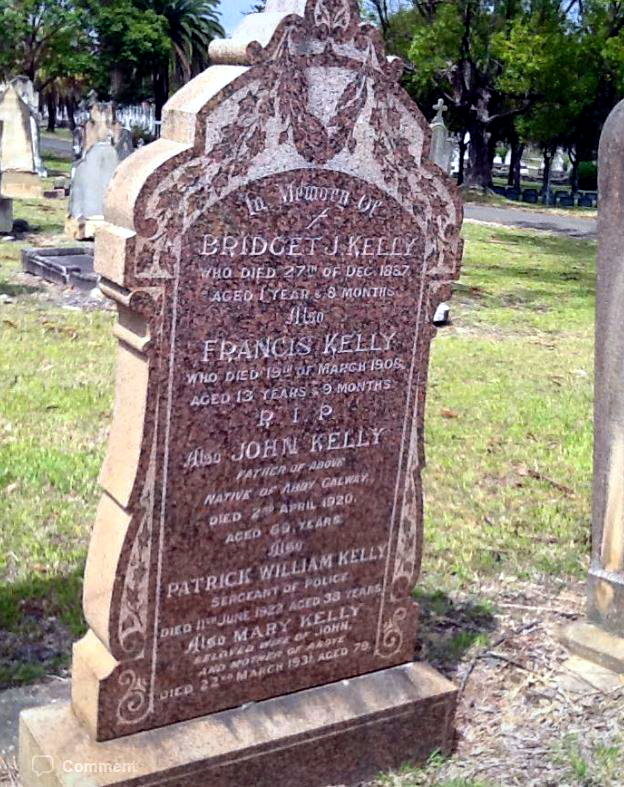 The deceased, who was a native of Sydney, was the eldest son of the late Mr. John Kelly and of Mrs. Mary Kelly, of County Galway, Ireland, and residents of Ultimo for over 35 years. Sergeant Kelly joined the police force in 1904, and rendered fine work to the department, gaining the confidence of the Inspector-General and other officers, and the esteem of all associated with him. The deceased was an inmate of the hospital for only one week, when he was called to his reward. He was attended spiritually during his illness by the Rev. Fathers McHugh and Quinn (Maroubra), who administered the last rites of the Church. The interment took place at the Catholic Cemetery, Rookwood, on Friday, the 13th inst., the funeral leaving the residence of his mother, 79 Quarry-street, Ultimo. The cortege was headed by the Police Band, followed by about 100 uniformed and 50 plain clothes men and detectives, who proceeded with the other mourners to the graveside. The Rev. Father J. Troy (Diocesan Inspector of Schools) officiated, and, in referring in feeling terms of the remarkable courage and fortitude shown by Sergeant Kelly during his last hours, said he was typical of those who comprise the splendid force of police that the State of New South Wales is justly proud; and he took this public opportunity of expressing his appreciation of the members of that great body, who were the custodians of peace and the guardians of life and property. The chief mourners were his mother, Miss H. Kelly (sister), Mr. J. J. Kelly (brother), Mr. and Mrs. J. H. Finn and family (Carlton), Mr. and Mrs. J. J.White and family (Erskineville), Mr. J. Farraher, uncle (Redfern), Mrs. Goodridge (Moss Vale), Mr. and Mrs. Tom Mack (Moss Vale), Mr. and Mrs. Spencer (Taralga ), also at the graveside were Superintendents Park (representing the Inspector-General of Police), Bannan, ex-Superintendents Brooks and McLean, Inspectors Turbet, Long, Robertson, Pauling, King, Mankey, and Mr. John Robinson (ex-local auditor, Commonwealth Audit Office, Sydney ). The pall-bearers consisted of six comrades of the deceased from the foot and water police. — R.I.P.